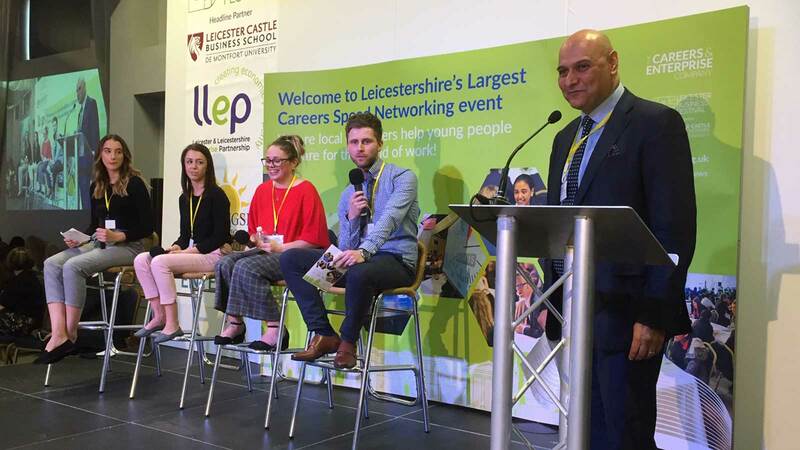 Nearly 300 students from Leicester and Leicestershire schools and colleges networked with 150 employers at an exciting speed networking careers event, which took place at Leicester Racecourse. The students aged between 13 and 18, took part in the region’s largest careers event of its kind organised by the Leicester and Leicestershire Enterprise Partnership (LLEP) as part of the Leicester Business Festival, and sponsored by Morningside Pharmaceuticals. Kevin Harris, Chair of the LLEP said: “We are working hard to build more engagement between schools, colleges and businesses through our work with the Careers and Enterprise Company. It is so important for young people to understand the employment opportunities available to them locally and which companies are located in Leicester and Leicestershire. This year’s event was sponsored by Morningside. Our Chief Executive Dr Nik Kotecha OBE, who is also a LLEP Board member, said: “I felt very privileged to be one of the employers taking part in the speed networking event. What struck me was how engaged and well prepared every young person I spoke to was.